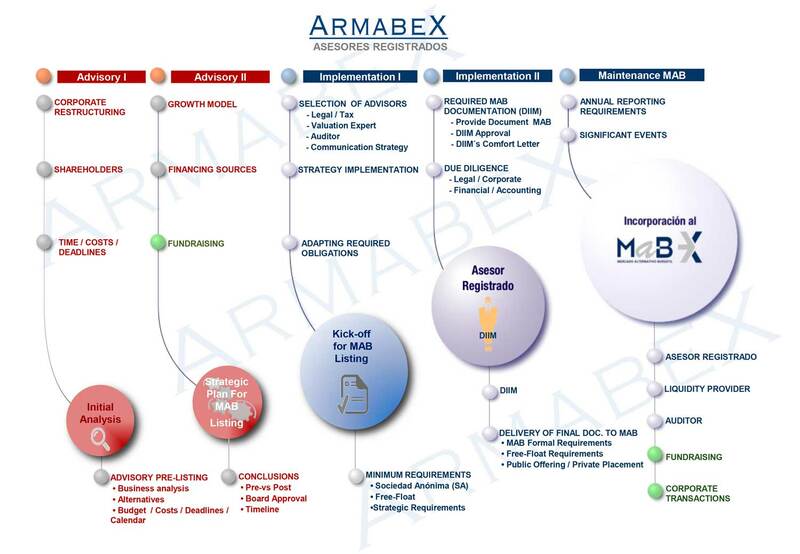 Authorised in 2008 as Nominated Advisor, Armabex Asesores Registrados has become a leading advisor for the design, structuring and incorporation of SOCIMI as well as their listing on the MAB. The Nominated Advisor is a mandatory figure in every MAB listing project. As a Nominated Advisor, Armabex is regulated and supervised by the CNMV and Bolsas y Mercados Españoles. Madrid-based, our seasoned and highly dedicated team provides advisory and execution services to domestic and international Real Estate Asset Managers across Europe, Latin America, the Middle East and the United States. A SOCIMI (Sociedad Anónima Cotizada de Inversión Inmobiliaria) is a public limited company whose main activity is to invest, directly or indirectly, in rented real estate assets or in the capital of other SOCIMI or foreign entities pursuing a similar activity. It is the Spanish version of Real Estate Investment Trusts already existing in other jurisdictions. SOCIMI were introduced in Spain by Law 11/2009 of 26 October, 2009. Mandatory trading on a regulated stock exchange or multilateral trading systems (i.e. MAB, EURONEXT…). At least 80% of their assets must be rented real estate assets and/or shares of other SOCIMI/REITs. At least 80% of the earnings (excluding any income arising from the sale of qualifying assets) must come from leases or dividends distributed by any subsidiary SOCIMI. Real estate assets must remain leased for at least three years. The SOCIMI must have a minimum share capital of 5 million euros. 100% of the profits received as dividends or profits coming from other entities. At least 50% of the profits obtained from the sale of assets or shares in other SOCIMI. At least 80% of overall earnings from real estate rentals. Armabex provides a wide range of services tailored to the needs of the client. We are a one-stop-shop Socimi administrator providing highly focused services to Real Estate Investment Managers domiciled in multiple jurisdictions. We offer a broad range of innovative solutions built on our know-how and experience. Our operating model is flexible; we work closely with our clients to design a tailor-made solution that meets their needs and expectations. We believe that our client’s success is our success. By offering fast and professional services we help them increase their operational efficiency while reducing risks, so they can devote their time to delivering high investment returns to their clients. We have an open architecture, with the main types of advisors participating in the project (Legal, Valuation Company, Auditor, Liquidity Provider, Accountants, etc.) ensuring the right selection of advisors, cost control, meeting deadlines, and timely execution. International managers can rely on Armabex for everything except managing their assets. Armabex offers a full-service partnership approach for clients looking for truly personalised service. We place primary importance on forging close working relationships with clients, and have are absolutely focused on meeting their needs. Team Selection: Armabex has thorough knowledge of the key advisors to SOCIMI which ensures that the most appropriate team is put together, tailored to each specific project, with the correct scope for each mandate, and at the right price. Corporate Structure: Defining with the legal advisor and the management team the most appropriate corporate structure for the project. Socimi Domiciliation and Administration: Armabex, through one of the leading international companies in the sector, manages the day-to-day business, which allows for efficient operations on an on-going basis. Growth model: Analysis of different alternatives (capital increase, contribution in-kind, etc.). Project Schedule: Defining a detailed timeline for the Project. Project Kick-off: Coordinating kick-off meeting with different parties involved in the project. Reviews so that the project sponsor meets the legal and regulatory requirements to list its shares on the MAB. Advice on agreements and decisions to be made. Coordination with external advisors for the reception of the information required for the DIIM. Elaboration of DIIM and presentation to the MAB for approval. In coordination with the SOCIMI, meet the MAB’s information requirements. Attending Shareholders Meeting and following up on the agreements reached.